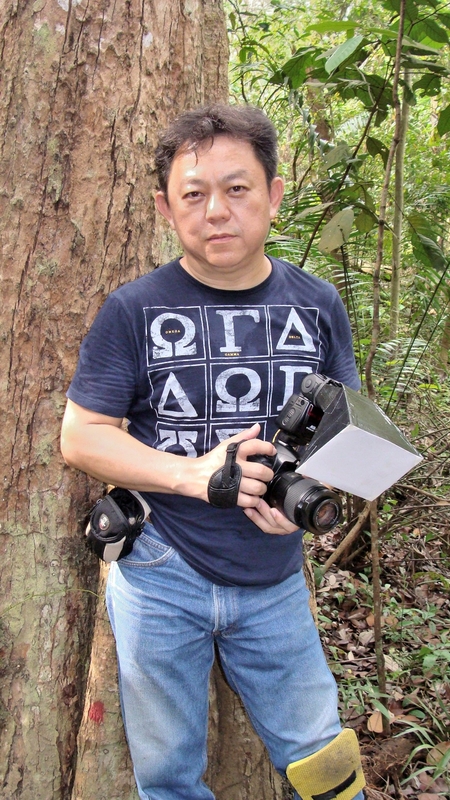 ← Sony A77 Mark II – “A” Mount is Not Dead. Picture: A series of professionally done food photos by ourshutterjourney.com playing on a slideshow. 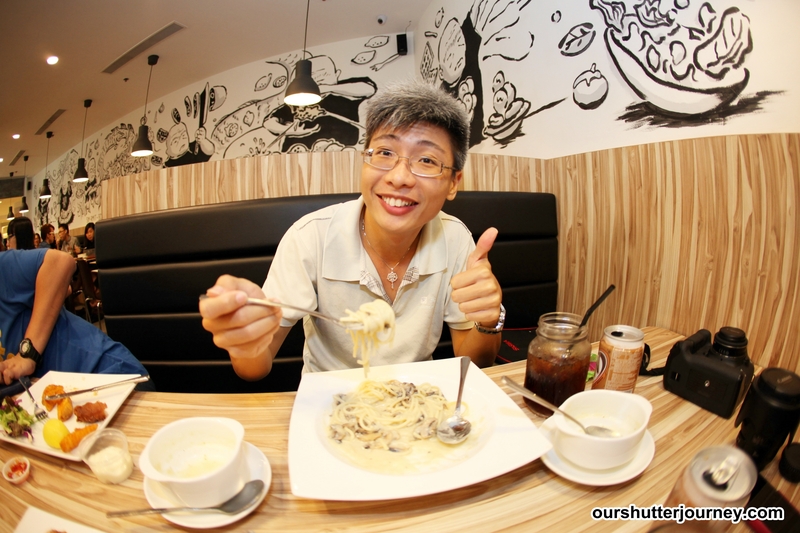 08th May 2014, Singapore – Recently, ourshutterjourney.com was contracted by Danny Teo, Managing Partner of Eighteen Chefs@Dhoby Ghaut (The Cathay) to shoot their menu items in a “casual & tantalising” fashion as he wanted to create a “colorful & optimum dining experience” for his customers. The shoot were then carried out about 2 months ago..
Last week, we received a call from Danny and we were told that he had our photos framed and currently on display around the restaurant. Out of curiosity, we decided to pay the outlet a visit to check out our works on display. 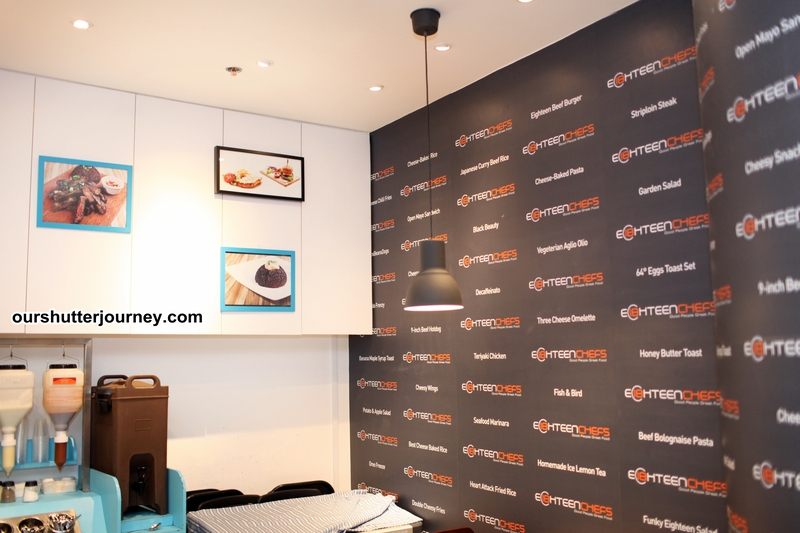 Danny selected a mixture of colors for the photo frames which further defines Eighteen Chefs’ objective of being a “Casual dining” and the splash of colors brings on a lively feel to the overall ambience that actually encourages relaxation while diners dine. The photos were displayed on pillars, cabinet face, walls & even runs as a slideshow on the large screen right outside the restaurant. After we have photographed our works that are on display, some “evil thoughts” came to my mind. Since Danny is not around, it’s lunch time and Benny Ng & Kase Low were together with me, so we hatched a little prank again. The last round when we hatched a prank, it got the 3 of us “marked” by camera shops so this time we will try to pull off another prank since the staff don’t really know who we are. So we got ourselves a table. Like any other customers, we sat ourselves down and ordered food. 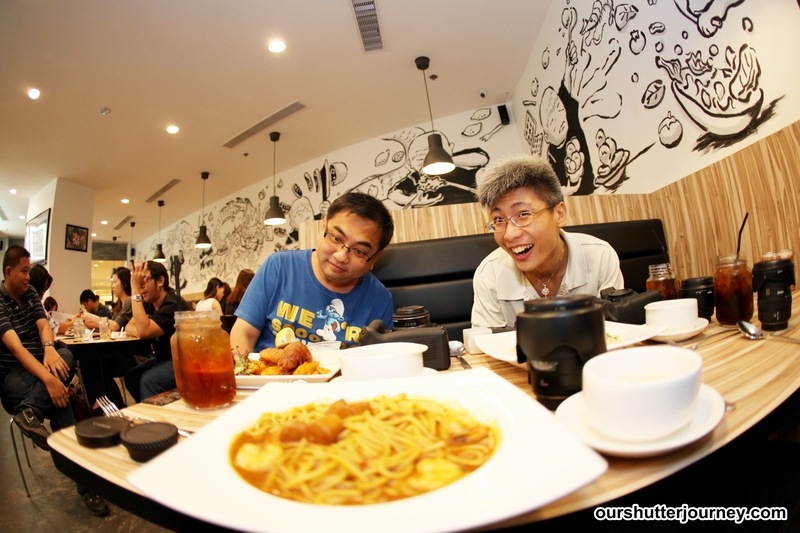 As the food were served progressively, we didn’t touched the food, instead, we were having fun with our cameras. At this point, some of the staff & customers were already annoyed with us as our camera flashes keep going off. (grins) See what we did below. 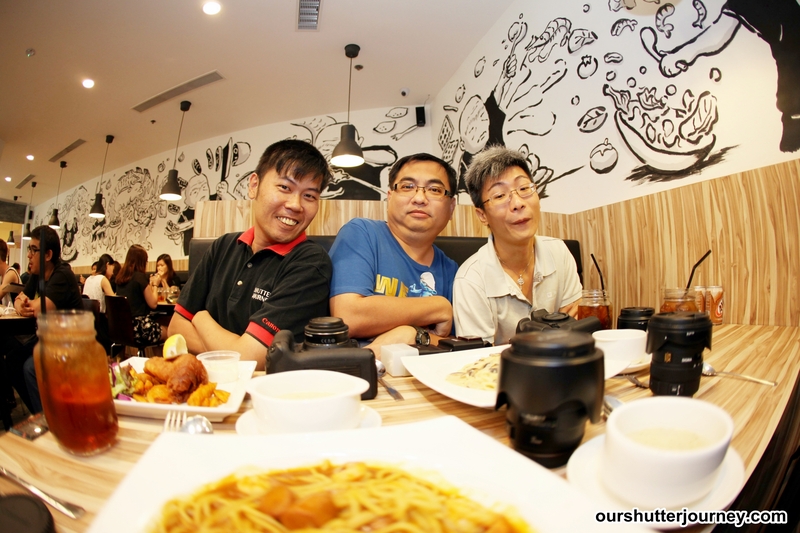 After having fun annoying the diners with our flashes and disturbing the staff by asking them to keep shooting us, we decided to pull off the ultimatum. We have all our food arranged systematically and have our equipment strategically placed in between the food items just like how model kits are packed in boxes. Then all 3 of us walked out of the restaurant leaving the table & our equipment behind – see below photo. To be honest, I swear that every other person in the restaurant were looking at us and gave us the puzzled look. 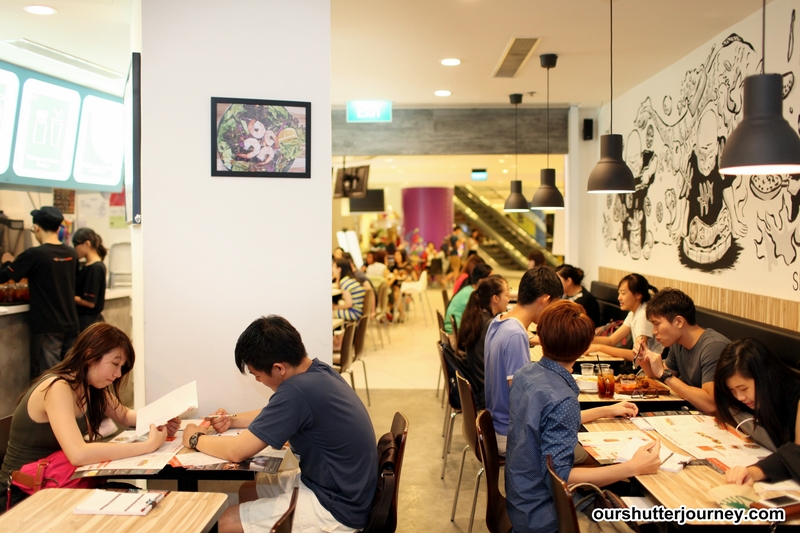 Be it diners or the staff, they all had that same puzzled and confused look. 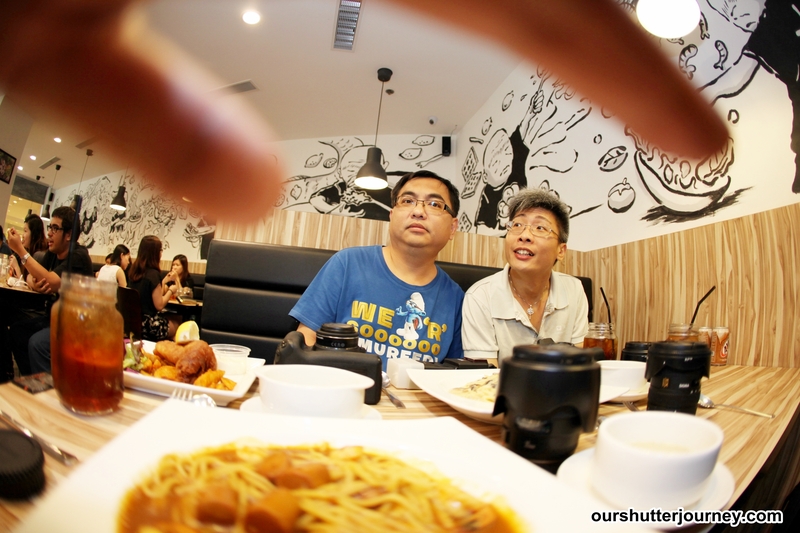 As we stood outside the restaurant and watched, people were looking left & right but no one went near our table – complete with untouched food & lots of photography equipment. We left the table like this for a full 10 mins and when puzzled & confused look ended its effect, we went back in and have our lunch like as if nothing had happened. Misson accomplished. 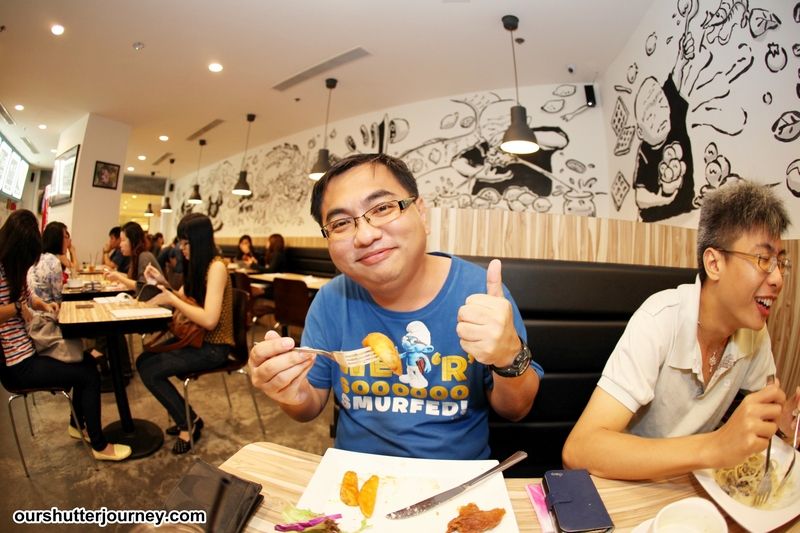 We were thankful to be engaged by Danny to do the shoot for Eighteen Chefs@Dhoby Ghaut (The Cathay) as we had lots of fun doing the shoot and working with the staff to have the food dressed up. The staff are friendly, very easy-going and always smiling. In fact, they gave me the feeling that it is as if I’ve know them personally just like long time friends. We were also apologetic that we “annoyed” the diners and confused the staff during the above visit while Danny was away that day. We had fun “playing” and enjoyed our lunch! The food quality was excellent & the service rendered by the staff (who doesn’t know who we are) are great too! Danny, hope you don’t choke on the Heart Attack Fried Rice when you sees this article. 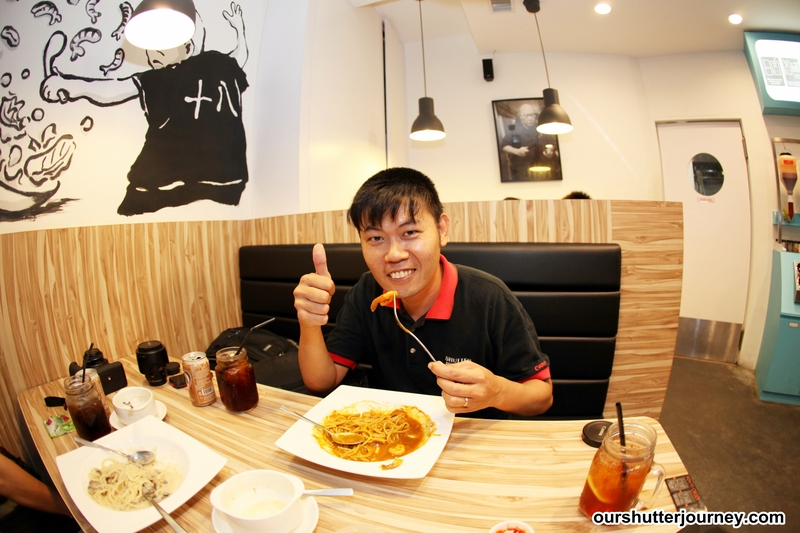 So people, if you are curious about what’s so special about the food photos that ourshutterjourney.com had done for them, do pop by for a meal and check out our works. And if, you are a fan of casual dining of oriental-fusion-with-western-influence-plus-little-twist, do make your way to Eighteen Chefs. 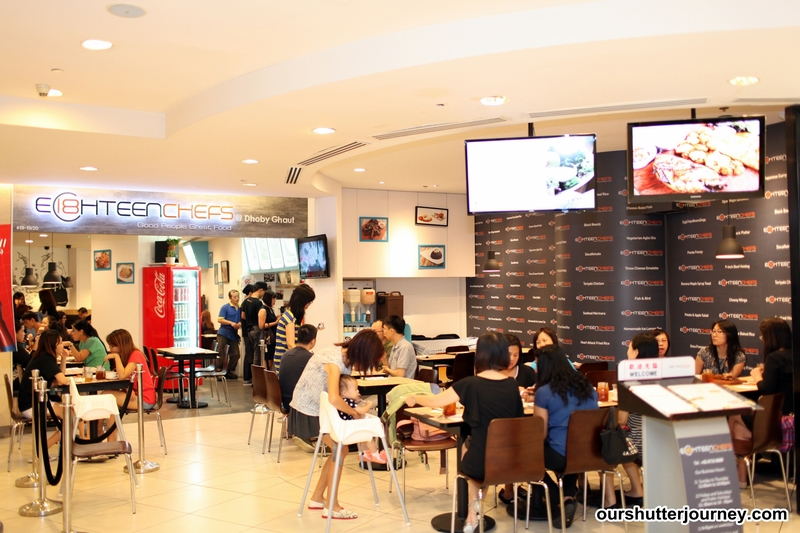 Here at Eighteen Chefs, we strive to provide our customers with good quality food at an affordable price – freshly prepared and fast everytime! Without compromising our service standards, we hope you will enjoy yourself in our own unique ambience and be spoilt in a great variety of food choices. We wish to spread Benny’s story of experience, strength and hope to inspire troubled youths and people with conviction backgrounds to find alternative positive ways to reintegrate back into society. We have worked with other social agencies both locally and regionally to help create this awareness and to provide a platform for these group of people to realize their talents in the Food & Beverage industry. We hope to expand out of Singapore and make Eighteen Chefs as part of the lifestyle to the youths globally.By providing them with a safe and non-judgmental working environment, we believe that we are giving them a chance to also work on their recovery through this unity of bond, which will eventually allow them to find a better and happier path in life. 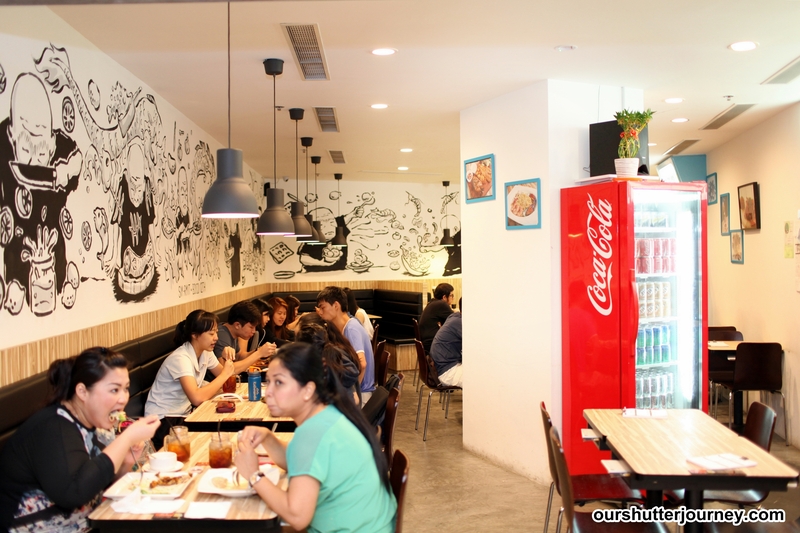 We’re very proud of our team in Eighteen Chefs. 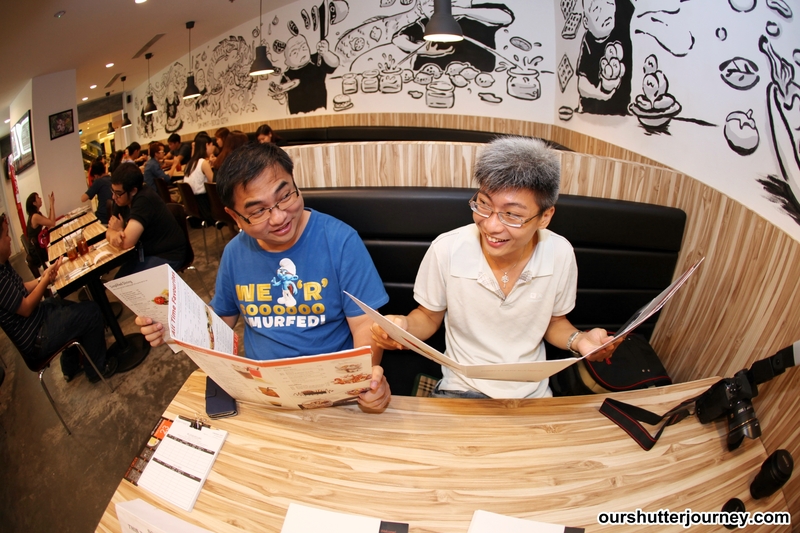 Without them, Eighteen Chefs wouldn’t be Eighteen Chefs today. Even though we didn’t always succeed with all our staff, but we have great touching stories that the staff would love to share. We will upload them as soon as we can. 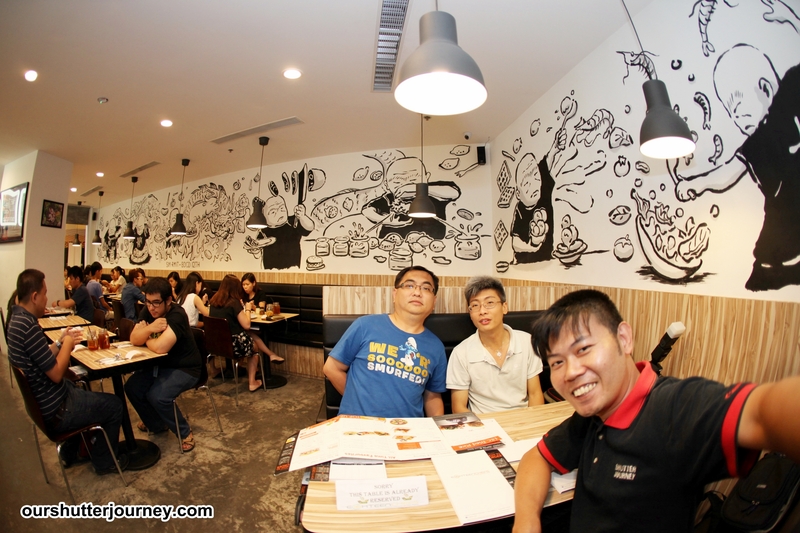 This entry was posted in Featured Photographers, Non Photography, Photography Articles & Videos, Uncategorized and tagged Eighteen Chefs, Eighteen Chefs@Dhoby Ghaut, ourshutterjourney.com. Bookmark the permalink.